What can a SLP help with? What is Social Communication/Pragmatic Language? Pragmatic Language is the social use of language and the underlying social "rules" that individuals follow when communicating. An individual may have strong vocabulary knowledge and generate grammatical sentences, but still struggle to effectively communicate with those around him or her due to difficulties with social language. There are several components that make up Pragmatics. First is the understanding of different uses or purposes for language. For example, an individual should be able to use language to greet others, make requests, comment on their environment, question, and negate. Pragmatics also looks at how an individual can change his or her language based on their environment or listener. A child must learn that how he or she speaks and acts on the playground will be very different from in the classroom. Lastly, Pragmatics describes how an individual follows general "rules" of speaking and holding a conversation. This includes, knowing how to take turns speaking in a conversation, being able to maintain a certain topic, and using appropriate nonverbal language when conversing. The true cause of pragmatic language delays is still unknown. Research has suggested that it may be a neurodevelopmental disorder. Pragmatic delays are also associated with other diagnoses such as autism spectrum disorder, attention deficit hyperactivity disorder, nonverbal learning disorder, and anxiety. The speech language pathologist (SLP) will complete formal and informal language assessments. The assessment will include looking at how the individual is able to use language for different purposes (e.g., greeting, requesting, asking questions, responding to questions, etc.). It will also look at how he or she understands nonverbal language cues and how he or she can problem solve social situations. Typically, the SLP will ask the parents to complete a questionnaire to determine how the individual uses language in different environments and what practical difficulties he or she has in the community. Treatment will use a variety of activities to target the specific social language skills that are impaired. Therapy tasks for young children may be based on games and other play activities; tasks for older children may be related to more social situations. The SLP may explicitly teach social communication rules that the child has not picked up on his or her own. The SLP will educate parents about the child's problems and ways to work on language at home. It is very important to practice social language skills in different environments and with different people. Therapy may also be done in small groups to allow functional practice of the social communication skills in a therapeutic setting. Our SLP specialists are ready to assist you on your path to better communication! 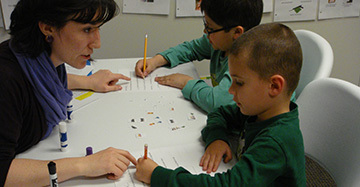 The Center for Speech and Language Disorders' (CSLD’s) skilled speech-language pathologists evaluate, diagnose, and treat a wide range of communication needs including expressive language, receptive language, auditory processing, social language, articulation, voice, fluency, hyperlexia, reading and writing.